Life of Faith dolls, which grew quickly in popularity, provide role models to help girls imagine and experience a lifestyle of faith. This line of dolls features five main fictional characters: Elsie, Millie, Violet, Laylie, and Kathleen. They are ordinary girls with extraordinary faith, encountering inspiring adventures that make them intriguing heroines. Similar to the American Girl Dolls, Life of Faith dolls emerge from different periods of American history and accompany books that chronicle their experiences and, in this case, testify to their devotion to Jesus. This line was designed to help mentor girls in their life of faith. These dolls are 18-3/4 inches tall and made of an exceptional quality vinyl. Most of the clothing is interchangeable with other popular 18 inch dolls. 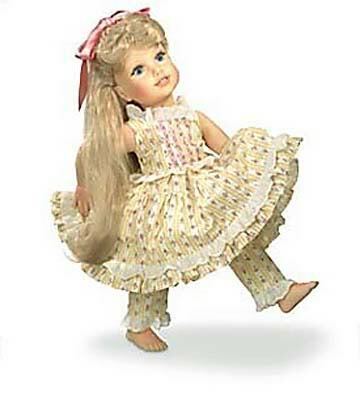 The dolls have all rotationally-molded vinyl; the head, arms, legs, and torso are ball jointed, so the dolls can sit, stand, and be posed in many positions. The dolls have hands that can be positioned to pray, and arms that can be raised in praise, and they also can bow their heads in prayer. These dolls are sculpted by an award winning artist. The clothing designs are based on historical research. They are more detailed and use more quality and abundance of, fabric and trim than most other brands of 18 inch doll clothing. Each doll has a full wardrobe that was created to portray her lifestyle. We were exceptionally pleased to offer this line of dolls.